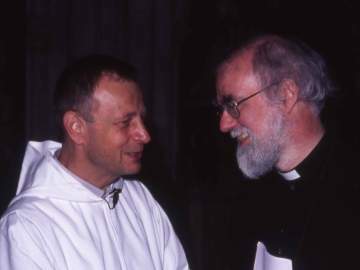 When Brother Alois returned to Taizé after taking part in prayers in Bradford, London and Berlin, he remarked how joyful all of these occasions had been, and how striking it was to have so many young people taking part in each of them. When London suffered the terrorist bomb attacks in July 2005 and the perpetrators were found to come from West Yorkshire, many people feared trouble in Bradford with its high Asian population. That did not happen. The actions of local faith leaders played an important role in this. The Touchstone Centre, near to the University, is a meeting place run by the Methodist Church, but with a very ecumenical outlook. A Catholic Mercy Sister told how she lives in a predominantly Muslim neighbourhood. It was very difficult at first for her neighbours to understand the life she led. Little by little trust, which remains fragile despite everything, was built up. When she explained that she was collecting clothes for the poor and preparing meals to feed the hungry, one Muslim man told her that she was a very good Muslim. She then told him that he was a very good Christian! She invited the women to come and help her cook, which they did willingly. Now the homeless of Bradford often eat South Asian food! Maariyah, a young Muslim from Glasgow, gave her insights at the meeting - “Living and working with people of other faiths - what can we share, how can we become friends?” which was attended by over 100 people. Many came in time for meetings at 4.00pm which were held in the hall of Westminster Catholic Cathedral and in Methodist Central Hall as well as in two Anglican churches. Brothers of the community helped lead the song practice and two of these workshops. 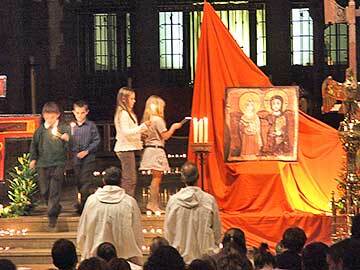 Other themes were: “‘Come, follow me!’ - but what is it that God expects of us?” and “Including those on the margins of society - what can we do?” which was introduced by presentations about working with the homeless, with prisoners and of involving people with mental health problems in a gardening project. Groups and individuals came from all over Britain: Truro, Exeter, Cardiff, Leeds, St Albans, Canterbury, Peterborough, Leicester, Norwich, Manchester, Reading, Cambridge, Portsmouth … Edinburgh, and at least one person came specially from Northern Ireland. From Jersey there was a group of 20 young people. The evening in the Abbey was long enough for everyone to enter into a rhythm different to that of everyday life in London. 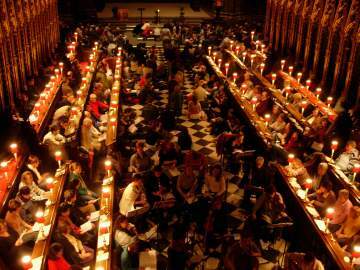 Most people came for the song practice at 6.15 and afterwards there were a few minutes of silence before the prayer began at 7.00 pm. We were in three quite separate parts of the building. 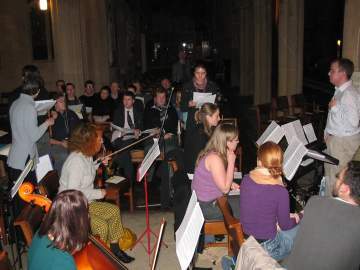 From the main nave of the Abbey, filled with young people sitting on the floor, there was just a narrow doorway through to the choir where the musicians and singers, about 150 of them, were sitting. Further up the building again, the crossing and transept held the larger part of the congregation. During the first part of the prayer, Brother Alois spoke in the nave of the church. Cardinal Cormac also greeted those who were present. Archbishop Rowan Williams had been asked to speak on the theme of trust. He began with the reading we had heard from the prophet Jeremiah (31:31-34) “… No longer shall they teach one another, or say to each other, ‘Know the Lord,’ for they shall all know me, from the least of them to the greatest.” The greatest trust of all is the trust that God has in us, leaving us free. We can let our way of looking at other people be changed by remembering that “this is a person whom God trusts”. 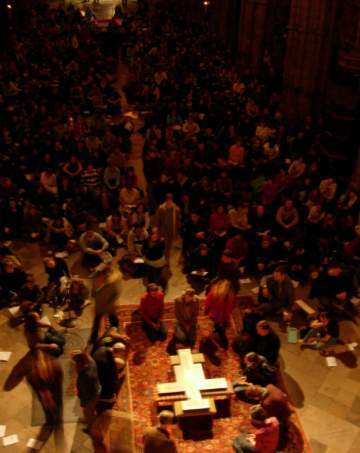 After the first hour of prayer, the cross was laid down in the nave of the church to begin the prayer around the cross. Brother Alois and the Church leaders went to the transept where a second prayer around the cross was held simultaneously. The Church leaders knelt and sat on the floor, as people converged from both sides of the crossing in order to kneel at the foot of the cross. 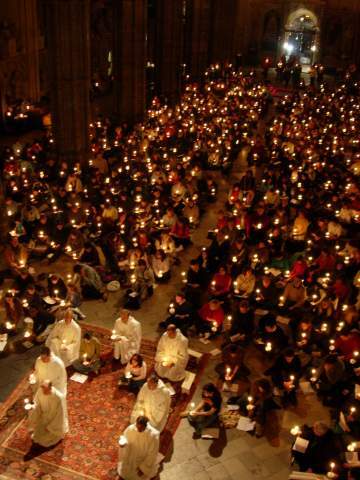 After nearly 40 minutes of prayer in both parts of the Abbey, the two crosses were placed upright as we sang Psallite Deo and children began the lighting of the tapers we had all received to symbolize the light of Christ. When everyone’s’ candle was lit, Nneka, a young woman from Nigeria, read the story of Mary Magdalene on the morning of the resurrection (John 20:1-9). While we still sang, Brother Alois led the Archbishop and other church leaders to the West Door of the Abbey, where people stopped to greet them on the way out.